L’atelier d’écriture de création permet aux traducteurs d’explorer leur créativité au profit de leur pratique de la traduction dans une démarche coopérative, conviviale et réflexive. Pendant l’atelier, les participants sont notamment invités à écrire selon des contraintes, à partir d’associations spontanées, grâce à des idées ou images puisées dans des textes contemporains, à lire haute voix leur texte, à pratiquer la critique littéraire, à analyser des aspects du fonctionnement de la pensée écrite. La particularité des ateliers du GFEN est cette analyse des processus de création au moment de l’atelier et l’apport de connaissances théoriques après la pratique dans le passionnant domaine des relations entre pensée et langages. Cet atelier conçu comme une action-recherche amène les participants à renouveler leur rapport à la page blanche, au texte d’origine et renforce le traducteur dans sa connaissance de ses propres capacités d’écriture. L’atelier sera animé par Michel Ducom, l’un des premiers inventeurs des ateliers d’écriture adultes en France, responsable du Secteur national Ecriture & Poésie du GFEN. 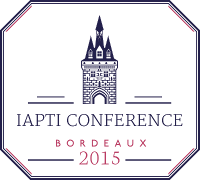 Les ateliers d’écriture de cette association comportent des temps de production d’écrits facilités par une animation attentive et un retour sur le travail accompli afin que les participants puissent prendre distance et comprendre les éléments mis en jeu. Cette phase de distanciation est constitutive de l’acte d’écrire ; elle permet aussi de se former à l’animation d’ateliers. Ils sont dans le prolongement de la longue expérience du GFEN en écriture adulte et enfant. This creative writing workshop allows translators to explore their creativity for the benefit of their translation practice using a cooperative, convivial and introspective approach. During the workshop, participants are asked to respect certain constraints, and base their writing on spontaneous association of ideas and images taken from contemporary texts; to read their own text aloud; to practice literary criticism; and to analyse how certain aspects of the written thought work. This analysis of the creation process during the workshop is characteristic of GFEN’s workshops – as is inclusion of theoretical knowledge after practice to explore the exciting relationship between thought and language. This workshop, designed as a combination of action and research, helps participants revisit their relationship to the blank page and the original text, and strengthens translators’ knowledge about their own writing skills. The workshop will be led by Michel Ducom, one of the first inventors of adult writing workshops in France, who is responsible for the GFEN’s National Sector of Writing & Poetry. GFEN (Group Francais d’Éducation Nouvelle – French Group of New Education) is a non-profit organization recognized by the French Ministry of Education, Youth and Sports. GFEN is a research and training movement that stubbornly tries to prove that its training practices (not only in writing) are up to its philosophical motto: “Everybody can”. The writing workshops of GFEN consist of a production part, facilitated by attentive guidance, and a revisit of the completed work so that participants can take a distance from their work and understand the elements involved. This phase of distancing is constitutive of the act of writing; it also allows participants to learn how to lead workshops. These workshops are neither therapeutic nor analytic, they are firmly focused on the creative process. They are in line with the long experience of GFEN in adult and children’s writing. Quick introduction to subtitling and how to excel as a translator in that field. Quick introduction to Audio transcription and how to excel as a translator in that field. Consolidating all your bilingual resources in one platform. RSI syndrome prevention, while enhancing translators’ predictive typing experience. Creating Termbases on the fly. Quick introduction to using RegEx in Studio 2014. Live demo movies (no theories, just practical examples). File type handling, and guidance to create your own when needed. Always carry your Swiss army knife; life can be a lot easier! Enhancing your TM Search experience. Handling XML files using advanced approach. Introduction to Custom Quality Assurance Rules. RegEx techniques to save the day in finalizing the preparation process. Creating an arsenal of searchable PDF resources, dictionaries, glossaries, Offline! Understanding PDF printing standards, in case a client asks for a print ready PDF (including crop marks, bleed marks, etc). Disaster recovery tips for password protected files sent over a weekend or in case you forget your own password! Disaster recover techniques with a client facing problems reading a printed PDF translation due to language support or font issues. Understanding Redaction and maintaining privacy when sending PDF files. Effective ways to sign NDAs and other PDF documentation electronically. Effective ways to comparing PDF files, to quickly work on an updated PDF file. OCRing technique and making corrections on the fly where the OCR has misinterpreted words. Learn how to increase your productivity and professionalism with the world’s most user-friendly and intuitive translation environment: during this 6-hour training you will have the possibility to get an introduction to the basics of memoQ, as well as master features you don’t necessary use on a daily basis. 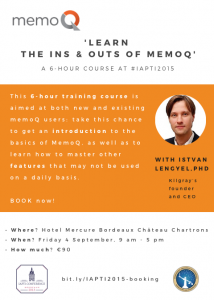 This course is aimed at both new and existing memoQ users. Managing Resources – how to maintain Translation Memories, Term Bases, LiveDocs corpora, Ignore lists etc. 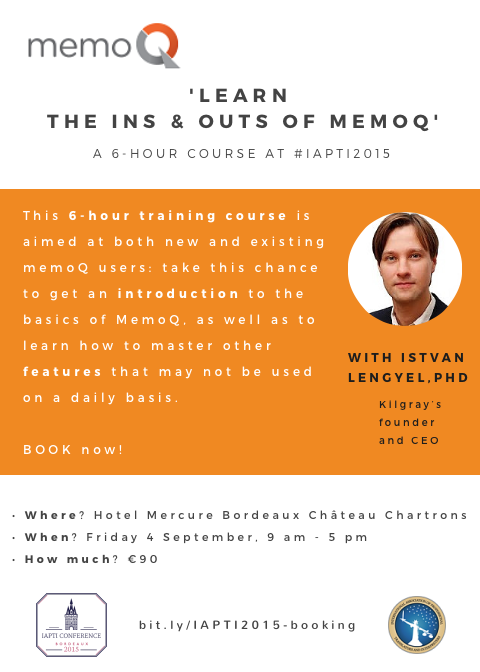 The training course will be delivered by Kilgray’s founder and CEO István Lengyel, PhD.